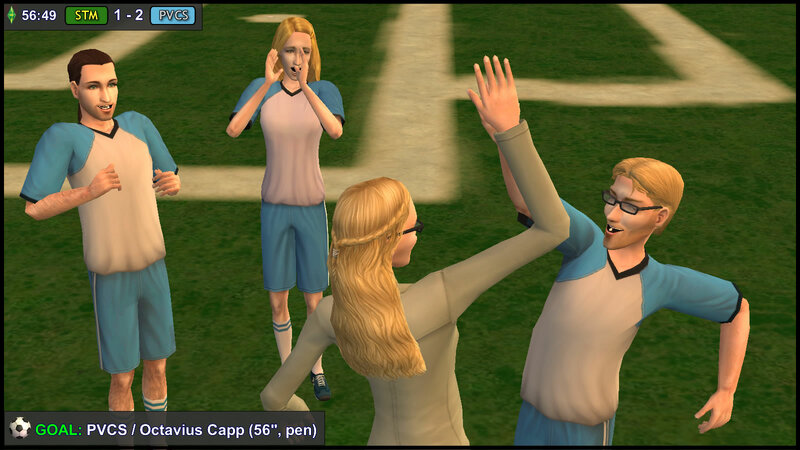 Just as PVCS Manager Regan Capp takes her seat on the bench, Linesman Ivanov discreetly gives her a thumbs-up. Regan quickly returns the thumbs-up, which Ivanov sees, before he runs off to his post on the opposite side of the pitch. From his post on the near side of the pitch, Linesman Xu waits for STM Manager Kent Monty to take his seat on the bench, and for their gazes to meet each other. When their eyes meet, Xu nods discreetly, and Kent acknowledges this with a nod, and relief in his eyes. 46″ KICK-OFF: Team PVCS’ turn to start. 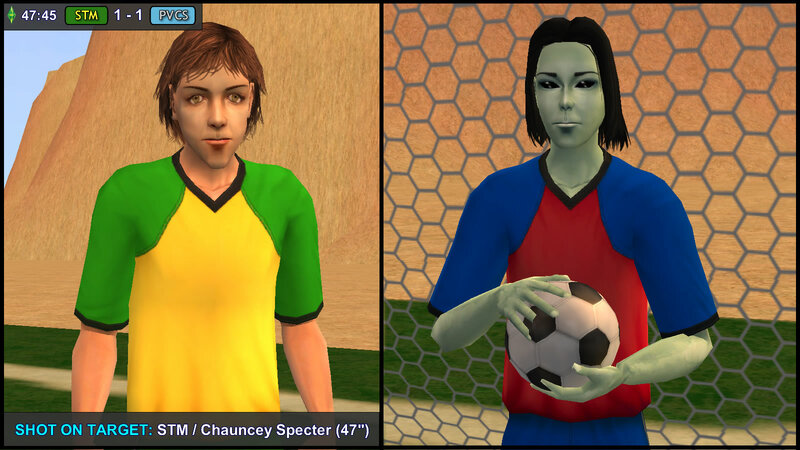 47″ SHOT ON TARGET (STM): Chauncey Specter gets the pass from Tank Grunt, and fires on target! But Juan Caliente fumbles with the shot, before eventually grabbing the ball. 49″ CORNER KICK (PVCS): Taken by Beau Broke. Lucy Burb gets the ball… she can shoot! Tackled? Lucy is down in the box! Is the referee pointing to the spot? No!! STM defender Claudia Monty didn’t even touch Lucy! The referee gives LB7 a warning. She got lucky, as she already has a Yellow Card. 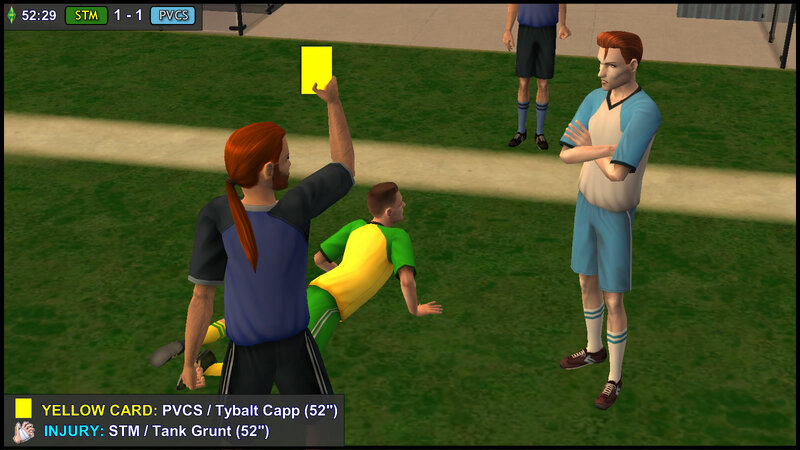 52″ YELLOW CARD (PVCS): Tybalt Capp, for taking down Tank Grunt. Aggressive touch. 52″ INJURY (STM): Tank Grunt is down, but after some quick treatment, he can continue in the match. 55″: FIGHT after a header clash between Ariel Capp & Claudia Monty goes terribly wrong. Ariel: Watch where you’re going!! Claudia: Your studs are everywhere! You are no better than your lousy parents — bullying a young kid like me! Claudia takes a few steps back, bends her upper body perpendicular to her legs, and swiftly rams her head full force into Ariel’s upper body. 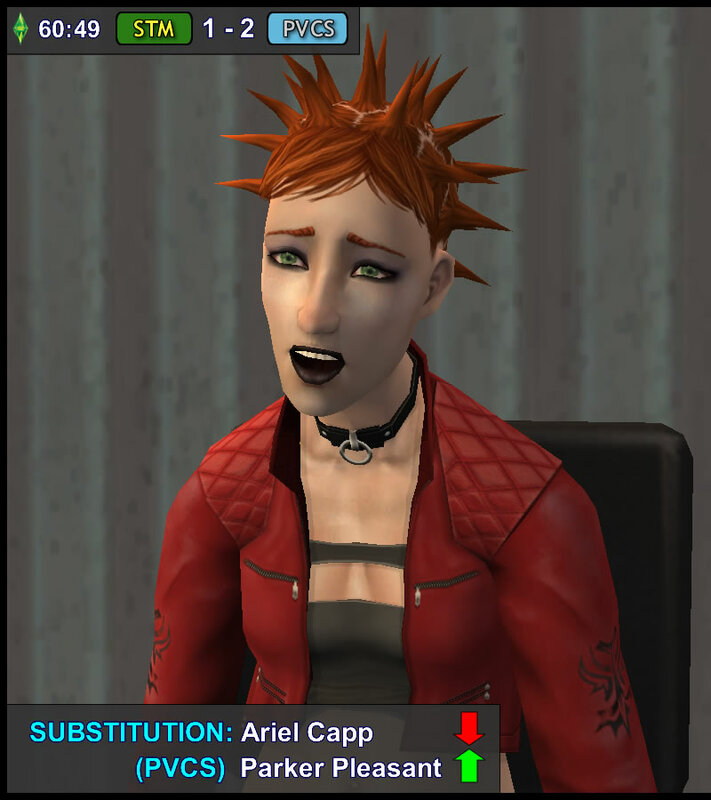 Ariel crashes to the ground, and yells an extremely rude phrase. 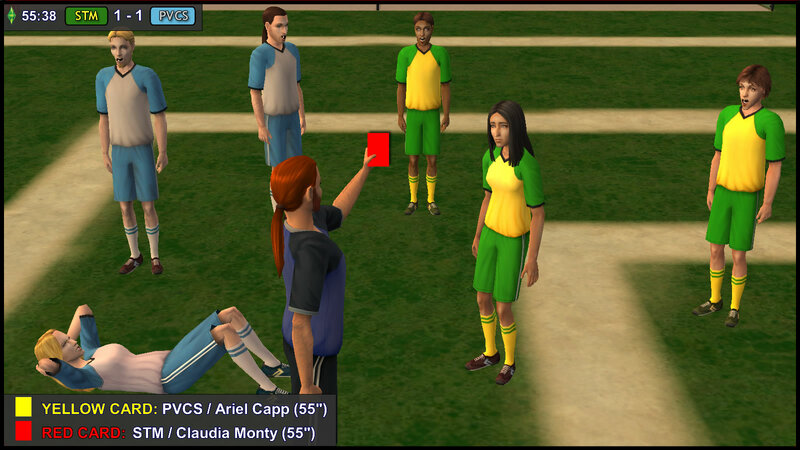 55″ RED CARD (STM): Claudia Monty. Violent Conduct (Headbutt, Zidane-style). Team STM is down to 10 players! Horatio Monty is sad. Over the years, Ariel’s parents said things to his sister that no young kid should have to hear. But it wasn’t right for Claudia to take it on the Capp daughter instead, who did not insult her until one minute ago. Claudia dared not look at Kent as she walked back to the Dressing Room. She assumed her “2nd Dad” would be angry and disappointed with her. She missed the gaze of fatherly compassion on Kent’s face. Since the headbutt occurred in the penalty box, the Referee points to the spot. 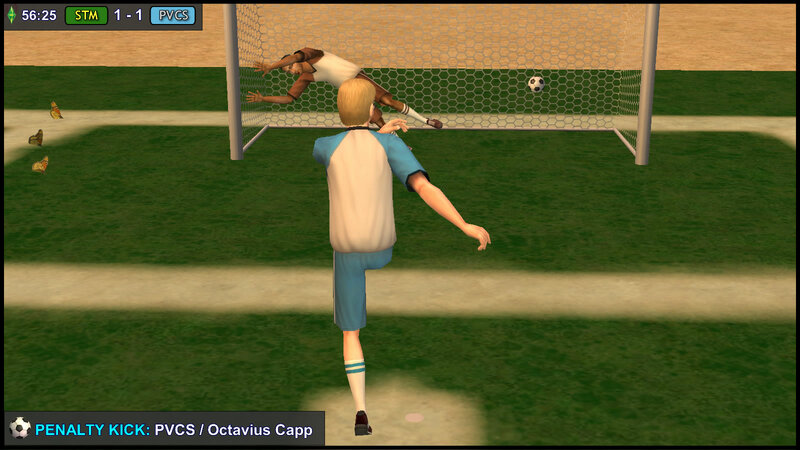 56″ PENALTY KICK (PVCS): Octavius Capp gets ready to take the spot kick, while Tybalt selfishly hopes that his young cousin will miss. Ben Monty guessed the wrong direction, and Octavius made no mistake. 60″ INJURY (STM): Isabel Loner is down again, after a fair challenge with Kelly Summerdream. Like her father 20 years ago, her hamstring problems are too much for her to continue in the match. A look of momentary concern crosses the usually-hard face of Albert Beaker. If Isabel is sent to the hospital, his parents are likely to take him to see his cousin after the match. Horatio Monty is dismayed. He wonders why all the girls he cares about are leaving the pitch so quickly. Has he lost his last chance to talk to Isabel Loner? Weak hamstrings seem to run in the Loner family. But Ajay is consoled by the fact that Isabel lasted longer in the 2035 match, than he did in the 2015 Match. 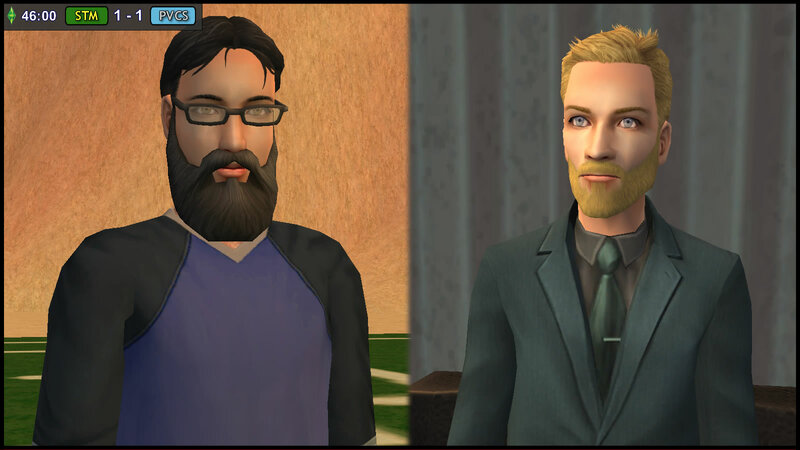 As Ariel Capp takes her seat on the bench, Daniel Pleasant suddenly realizes why he finds her attractive — her facial structure is similar to Kaylynn. 61″ FREE KICK (PVCS): Kelly Summerdream takes it, and goes directly for goal, but Ben Monty brings a save. AH: What did I say? A talent! 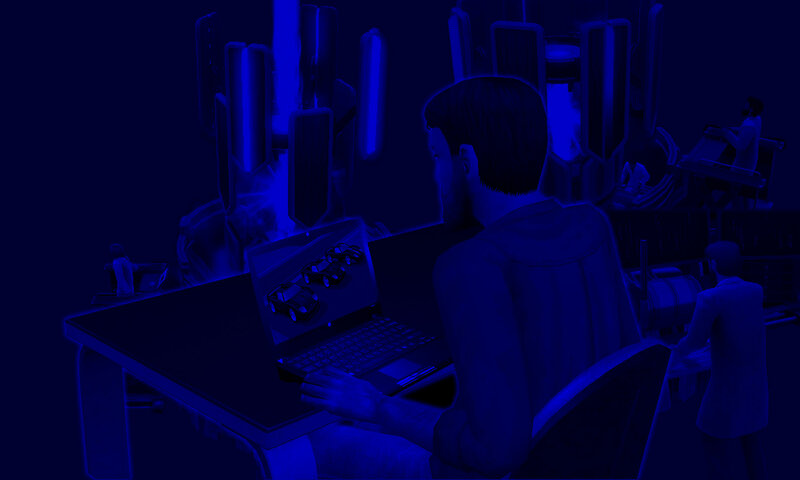 S2P: Yeah, I know. He’s just like a cat! Amazing dive skills! Funny I never heard his name before, a player of his caliber would’ve been a starter for FC Bayern Simchen! 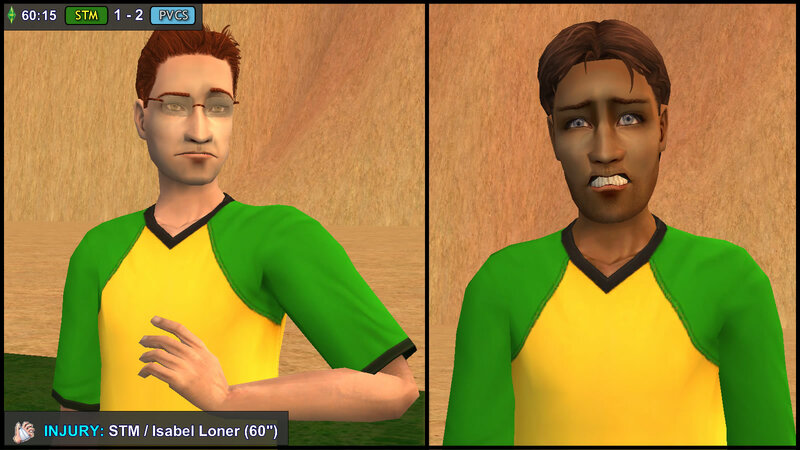 AH: Yeah, or at least playing in a football team! Kelly Summerdream discreetly touches the left side of her head. Uh oh… where did “it” go? It must have fallen off when she clashed with Isabel a minute ago… but she can’t possibly bend down to look for it. 63″ GOAL (STM) 2-2: Chauncey Specter just storms to the goal, right after getting the ball! He outruns Demetrius Dreamer and Dustin Broke, to score a rabona. Lucy Burb could learn from that! STM equalizes despite being one player down! 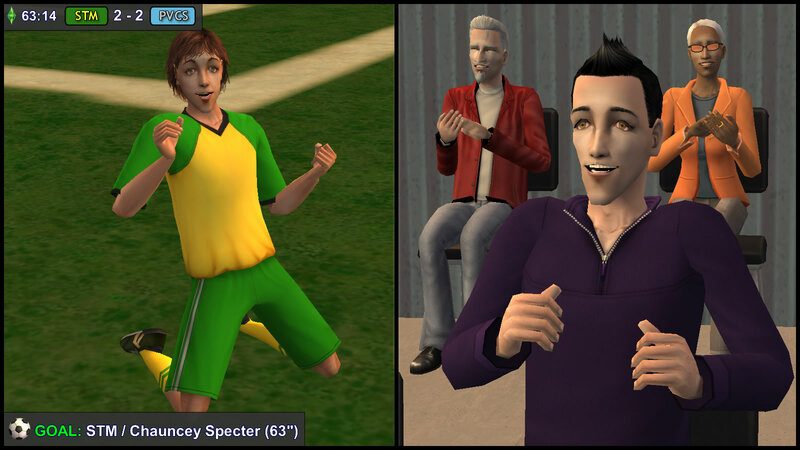 In the audience, Nick Specter stands up and cheers. But the VFL Simburg scouts look very impressed. How well can Team STM hold up, despite being one player down? Can Team PVCS capitalize on their advantage?